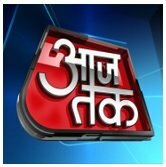 News TV Channel / Aaj Tak is India's best Hindi News Channel. Aaj Tak news channel covers latest news in politics, entertainment, bollywood, business and sports. Stay tuned for all the breaking news in Hindi! In November 2015, a video came online showing an Aaj Tak reporter bribing a kid with money to purchase liquor in order to convince him to give a negative statement against a BJP leader for which the channel received condemnation. According to a 2006 poll jointly conducted by the BBC and Reuters, of specific news sources spontaneously mentioned by Indians, Aaj Tak was the most trusted.